Morpheus is being tested at the VTB Flight Complex at NASA's Johnson Space Center. Careful consideration has been given to the surroundings when planning thrust levels and future trajectories. While we don't expect any complications, Morpheus has mutliple safety controls including onboard soft abort systems and a wireless Flight Termination System. In addition, during a free flight spotters are being placed in multiple locations to insure that if the vehicle goes outside of the established flight path - the engine will be immediately shut down. The VTB Flight Complex has three different pads that will be used for Morpheus testing. The single pad on the west end of the complex is used for both hot fire and tethered tests. 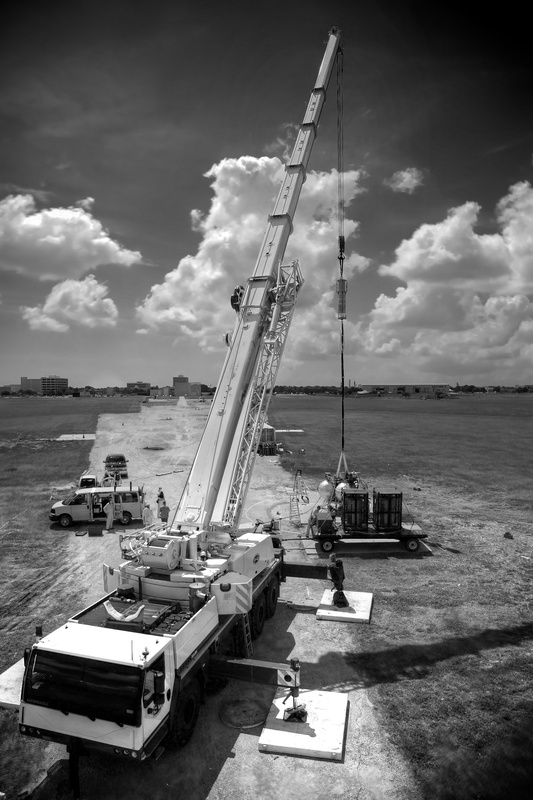 A crane is used during both tethered and hot fire testing. During hot fire testing the vehicle is also strapped to the ground. This allows the vehicle to remain virtually motionless during engine firings. 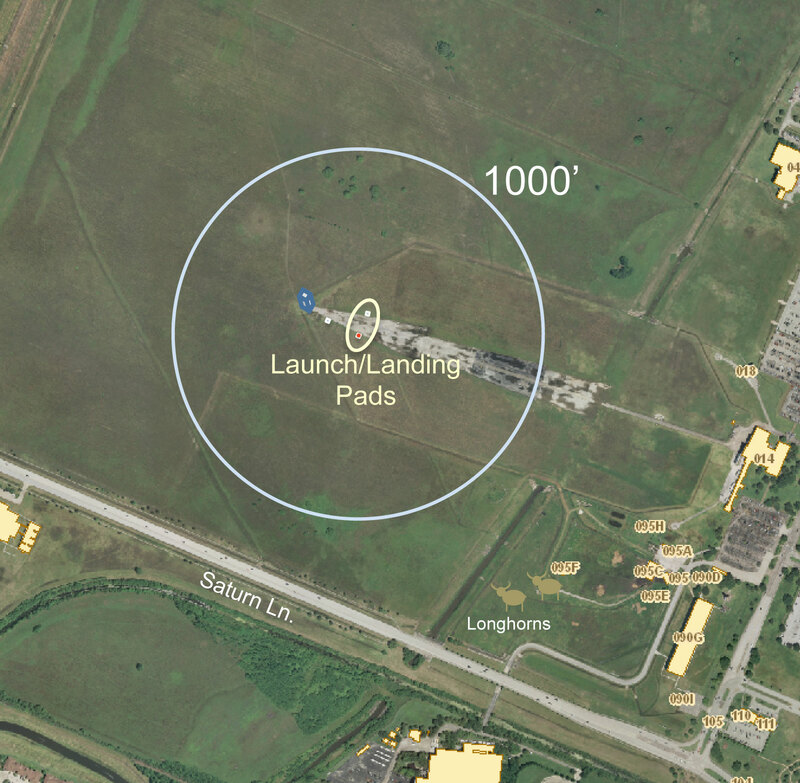 The other two pads are used for free flights. During a free flight Morpheus will fly up to a height of around 30m, then translate over to the western pad and descend for a soft landing. NASA's Morpheus Project has developed and tested a prototype planetary lander capable of vertical takeoff and landing. Designed to serve as a vertical testbed (VTB) for advanced spacecraft technologies, the vehicle provides a platform for bringing technologies from the laboratory into an integrated flight system at relatively low cost. This allows individual technologies to mature into capabilities that can be incorporated into human exploration missions. NASA's strategic goal of extending human presence across the solar system requires an integrated architecture. Such architecture would include advanced, robust space vehicles for a variety of lunar, asteroid, and planetary missions; automated hazard detection and avoidance technologies to reduce risks to crews, landers, and precursor robotic payloads; and in situ resource utilization to support crews during extended stays on extraterrestrial surfaces and to provide for their safe return to Earth. NASA's Advanced Exploration Systems (AES) portfolio includes several fast-paced projects that are developing these necessary capabilities. Specifically, the Morpheus project and the Autonomous Landing and Hazard Avoidance Technology (ALHAT) project provide technological foundations for key components of the greater exploration architecture necessary to move humans beyond low Earth orbit (LEO).